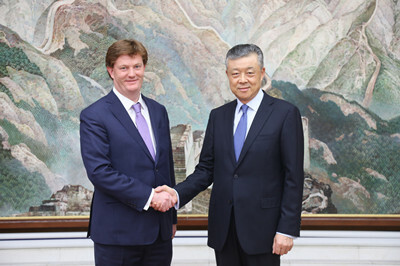 On February 6, Ambassador Liu Xiaoming met at the Chinese Embassy with Sir Danny Alexander, Vice-President and Corporate Secretary of Asia Infrastructure Investment Bank (AIIB). Sir Danny briefed the Ambassador on the development of the AIIB in recent years, saying that the AIIB has been continuously growing since its establishment three years ago. Its membership has increased from 57 to 93, covering all continents. Now it has become a world-class multilateral financial institution. As a founding member of the AIIB, the UK is willing to give full play to its strength in the fields of finance and law, actively support and participate in the operation of the AIIB, and contribute to the infrastructure development in Asia. Ambassador Liu spoke highly of Sir Danny’s work at the AIIB, hoping that he would continue to play his unique role in telling the stories of the AIIB and China-UK cooperation, helping more Westerners have a better understanding of the AIIB and the Belt and Road Initiative, and encouraging more people in Britain to participate in China-UK cooperation on Belt and Road Initiative, finance, investment and other fields, so that China-UK “Golden Era” could bear more “golden fruits” relations.